We tend to think of herbs as garnishes, but parsley takes a starring role in this fresh pesto. We tend to think of herbs as garnishes, but parsley takes a starring role in this fresh pesto. This parsley pesto is called "persillade," from the French word for parsley ("persil"). Usually a mix of chopped parsley and garlic, I bulked mine up with breadcrumbs. No food processor? Chop the parsley and garlic and stir other ingredients well to combine. Try it on toasted whole-wheat bread, steamed vegetables, roast lamb or chicken, too. Preheat the oven to 400 degrees Fahrenheit. Place a cast iron skillet over high heat. Pat the fish dry with paper towels. Lightly spritz the fish on both sides with non-stick cooking spray. Once the skillet is hot, add the fish to the pan. Cook for 2-3 mintues per side. 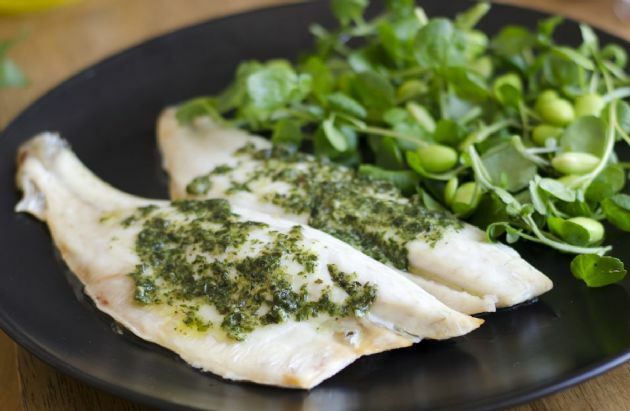 Top each portion of fish with 1/4 cup of pesto. Transfer the pan to the oven for 5 minutes to warm the sauce. Remember that the pan's handle will get hot in the oven! Makes 1 cup sauce, 1/4 cup per serving; about 3 ounces cooked fish per serving.